Have you chatted with your Granny lately? To some people, conversing with the elderly, even if it’s their family member, is very difficult to achieve. There are many reasons for this, of course. However, going out of your way to converse with an aging person is very rewarding, and not to mention, beneficial to their emotional health. 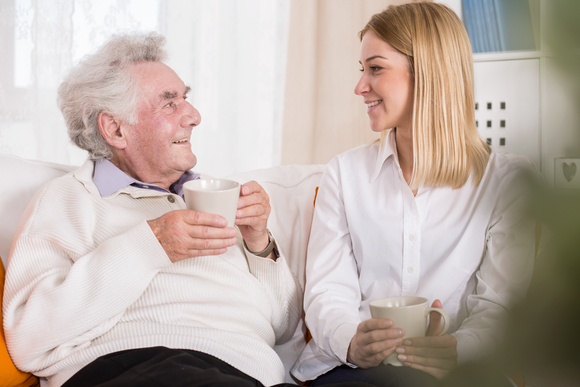 As a premier provider of home care service in Woodbridge, Virginia, we highly encourage you to spend quality time with an elderly beloved through great conversations. If you’re at a loss for words, just get them started to talk, and you’ll be glad to simply sit and listen. Here are appetizing conversation starters in question format that you can relay to your aging loved one. What is that one life lesson you always want to impart to others? How would you like yourself to be remembered by those around you? What career lessons would you like to share with someone struggling in their industry? What was the most difficult life struggle that you thought you could not overcome? What are you proudest of all? What part in your history do you clearly remember and why? What was your unforgettable pastime as a kid? What was the most embarrassing moment that you now laugh about? What is your financial management recommendation? What is that one thing you wish that you were really good at? What was the funniest event in your life? How has someone inspired you fully? Who is that one person whom you admire the most? What was your parents’ most memorable advice that you did not regret following (or regret not following)? How did you come up with the names of your kids? How were you able to know that you married the right person? In your opinion, what is the best age you should be in and why? What is that one thing you wanted to do even if you don’t get paid to do it? What is the book you will most recommend to someone younger and why? If there’s any food you have to eat every day all the time, what would it be and why? How do you find our suggestions? Surely, you can compose your own from this set. With our companion services in Fredericksburg, Virginia, we will strive to provide quality time and conversations with your aging loved one, so there will be no dull moment in their day. When you need this kind of service, feel free to keep in touch with us at OptimumCare Home Care Services. Our care providers are ready to assist them. For your other inquiries, especially if you’re looking for assistance on skilled nursing in McLean, Virginia, our lines are always open for you. If you find this post helpful, don’t forget to SHARE with a friend or loved one. This entry was posted in Companionship, Conversation with Elders and tagged home care services, Non-medical home care, Senior Care. Bookmark the permalink.